First of all, no need to say a thing about the Sikorsky Sea King itself. It´s one of the most successful and long-lived aircraft ever designed, being in service since the early 1960´s, and now only nearing the end. The british have licence-built the Sea King at Westland in various subtypes, and the germans have procured 22 of them in the early 1970´s. In fact, what was called a licence-build was more a complete redesign, so that the Westland Sea Kings have always only resembled their Sikorsky counterparts externally. Germany needed a replacement for their H-34 rescue helos, and the Sea Kings have been used in that role since 1975 by MFG 5 (Marinefliegergeschwader = Naval aviation squadron) at Kiel-Holtenau with aircraft deployed to rescue stations at Helgoland in the North Sea and Warnemuende at the Baltic Sea. Additional landing stations may be activated at Sylt and Borkum. One aircraft has been lost in 1998 in a transport accident; the Sea King was suspended from a CH-53 when the accident happened, so 21 Sea Kings remain. They are scheduled to remain in service until about 2010-12 to be replaced by the MH-90 naval helicopter that shall be introduced from 2007 on. All in all, they will have had a service life of a full 37 years, no small feat with aircraft in such a demanding use. Their operational requirements have changed over the years, as has the role of Germany´s armed forces in general. Apart from SAR, the Sea Kings are to be used in evacuations, humanitarian operations and in the anti-shipping role. The british had equipped their Sea Kings with Sea Skua missiles during the Falkland´s war, and the german Sea Kings have been retrofitted successively with the necessary installations. Currently, german Sea Kings support the german naval task force in Djibouti in operation Enduring Freedom. Moreover, the new Einsatzgruppenversorger (Task force supply ships) have hangars for two Sea Kings, so that hey are also deployed from shipboard. These new demands and the necessity to kep the ageing aircraft servicable have necessitated a major upgrade and service program; the Sea Kings are currently modernized regarding communications, navigational aids, FLIR, a new watertight cabin floor and, last but not least, all wires and cables are replaced – no small task. This program should be completed in 2005, the kit depicts a modernized aircraft. Given this long operational history and the many retrofits, current Sea Kings look just like this. Not quite unlike a late 109, they´ve begun to sprout bumps in various places to house the various electronics hitherto unknown. The addition of the missile launchers still adds to the general look of the aircraft, but to me it still looks becoming although I don´t know how up-to-date and effective the missiles are. You open the nasty Revell end-opening box, and what do you get? The kit consists of 2 light gray sprues, three darker ones and a clear sprue, the last one packed separate to avoif scratches. 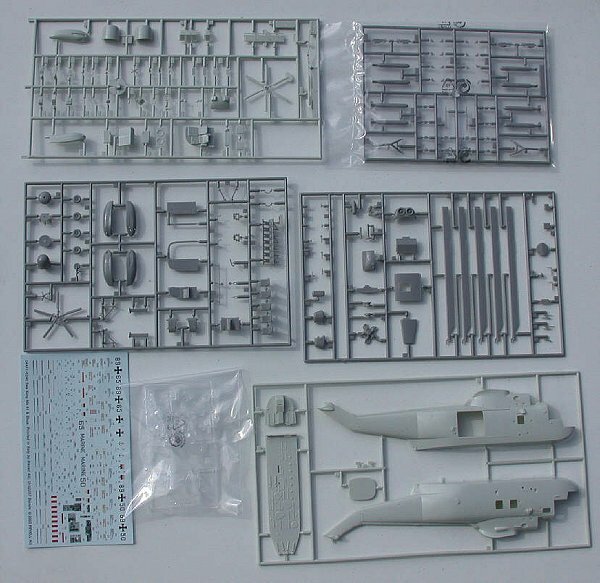 The darker gray sprues are the (new) ones with the german equipment, while the lighter ones are copyrighted in 1998 and should refer to the british Westland Sea King. So you get a number of parts for your spares box, including a tail rotor and seats. The parts are mostly free of flash, crisply molded with recessed panel lines where appropriate and likewise rivets. I found no annoying sink or ejector marks, only the two port windows for the commando version that can be cut out are visible in the shape of slight indentations. I don´t know whether this will be visible after painting. The clear parts are OK, yet not outstanding. One control panel is molded into the canopy and will have to be painted and drybushed. The decal sheet covers two aircraft of MFG 5 (Marinefliegergeschwader 5) at Kiel Holtenau, the only german unit flying the Sea King. One option 89+65, is in the current 4-tone camo, the other 89+50 is in an experimental all-gray scheme which may be adopted by the whole fleet. 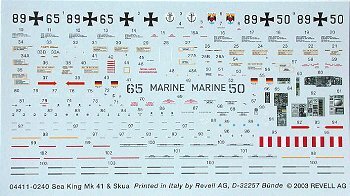 The decal sheet, printed in Italy, is very comprehensive, giving bizillions of stencils, also for the missiles (!) as well as instrument panel decals. Instructions are typical Revell, well made and easy to understand in 44 steps. Color reference is to Revell colors with the requisite RAL numbers (our german FS system). Especially the decal placement is good, better than with some other Revell kits I´ve built. All in all, this looks a very nice kit which should build into a very good representation of the original. I´m already looking forward to building it and will keep you posted. 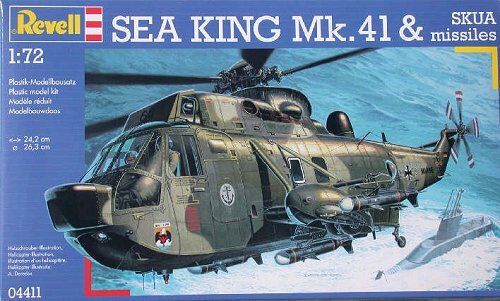 For more information on this version of the Sea King see the website of MFG 5 at www.mfg5.de They even have camo schemes and color references including RGB or CMYK settings, which is an outstanding reverence to us modelers in my book. Moreover you can get lots of pics. A good primer on the Sea King is as always the FAS website www.fas.org or the USN fact file at www.navy.mil , but other sites should have tons of info as well.